The genus Conexibacter (Monciardini et al. 2003) represents the type genus of the family Conexibacteraceae (Stackebrandt 2005, emend. Zhi et al. 2009) with Conexibacter woesei as the type species of the genus. C. woesei is a representative of a deep evolutionary line of descent within the class Actinobacteria. Strain ID131577T was originally isolated from temperate forest soil in Gerenzano (Italy). Cells are small, short rods that are motile by peritrichous flagella. They may form aggregates after a longer period of growth and, then as a typical characteristic, an undulate structure is formed by self-aggregation of flagella with entangled bacterial cells. Here we describe the features of the organism, together with the complete sequence and annotation. 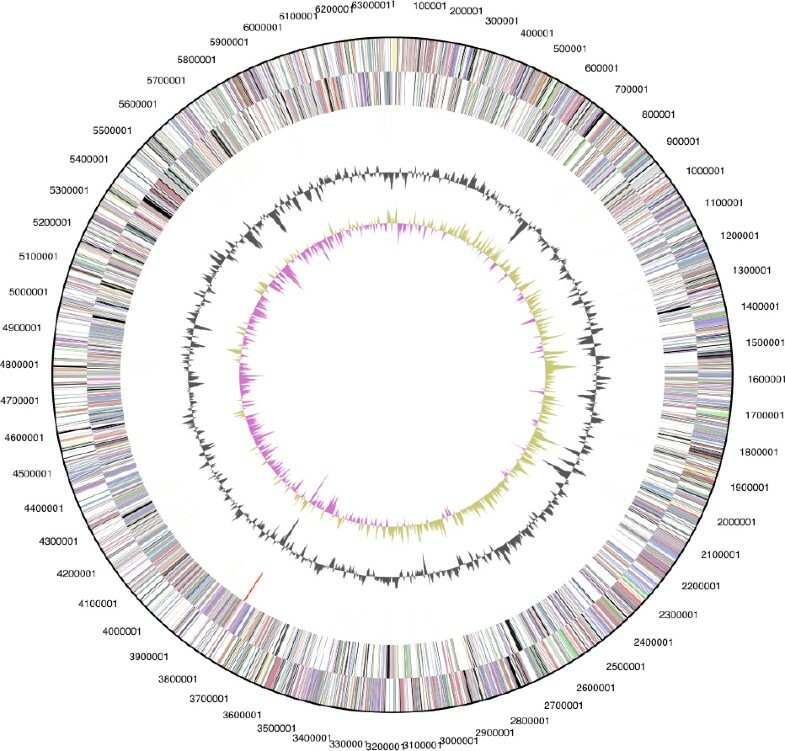 The 6,359,369 bp long genome of C. woesei contains 5,950 protein-coding and 48 RNA genes and is part of the Genomic Encyclopedia of Bacteria and Archaea project. 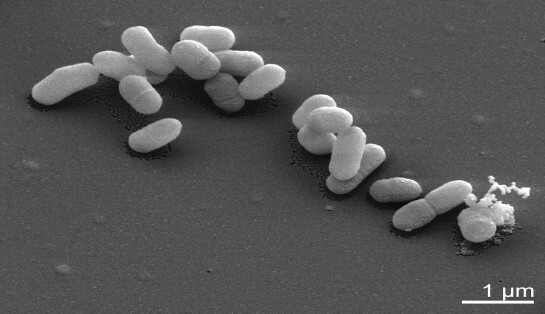 Strain ID131577T (= DSM 14684 = JCM 11494) is the type strain of the species Conexibacter woesei, which is the type species of the genus Conexibacter. Strain ID131577T was originally enriched from a soil sample used for isolation of filamentous actinomycetes and was first detected as a contaminant of a Dactylosporangium colony . Based on 16S rRNA gene sequence analysis and the composition of their signature oligonucleotides, the strain was subsequently assigned to the subclass Rubrobacteridae within the class Actinobacteria . Stackebrandt first placed the species C. woesei to the order Rubrobacterales [3,4]. With the description of Patulibacter americanus , the new order Solirubrobacterales was defined, again by the presence of 16S rRNA gene sequence signature oligonucleotides. The order Solirubrobacterales presently embraces the three families Solirubrobacteraceae, Patulibacteraceae, and Conexibacteraceae ; an emended description of the family Conexibacteraceae was published recently by Zhi et al. 2009 . Several distantly related uncultured bacterial clones with less than 97% 16S rRNA gene sequence similarity to C. woesei were detected in various environmental habitats such as soil [7,8]; (EU223949, GQ366411), soil crusts , Fe-nodules of quaternary sediments in Japan , sediment (FN423884), rhizosphere , acidic Sphagnum peat bog , fleece rot (DQ221822), and salmonid gill . Conexibacter related strains may also act as opportunistic pathogens as described in a few reports in which uncultured bacterial relatives were detected in bronchoalveolar fluid of a child with cystic fibrosis , or as enriched participants of showerhead biofilms . Here we present a summary classification and a set of features for C. woesei ID131577T, together with the description of the complete genomic sequencing and annotation. Figure 1 shows the phylogenetic neighborhood for C. woesei ID131577T in a 16S rRNA based tree. The single 16S rRNA gene sequence in the genome of C. woesei ID131577T is 1,536 bp long. The previously published 16S rRNA sequence (AJ440237) covered 1,470 bp only, but is identical to the genome-derived sequence in that stretch. Phylogenetic tree highlighting the position of C. woesei ID131577T relative to the other genera included in the subclass Rubrobacteridae. The tree was inferred from 1,429 aligned characters [16,17] of the 16S rRNA gene sequence under the maximum likelihood criterion  and rooted with the order Rubrobacterales. The branches are scaled in terms of the expected number of substitutions per site. Numbers above branches are support values from 1,000 bootstrap replicates if larger than 60%. Lineages with type strain genome sequencing projects registered in GOLD  are shown in blue, published genomes in bold. C. woesei is a Gram-positive, aerobic and non-sporulating bacterium, and forms small rods up to 1.2 µm in length (Table 1 and Figure 2). The strain is able to grow on complex media like TSA, BHI, Todd-Hewitt as well as on ISP2, ISP3 or R2A agar . Growth occurs at pH 7–7.5 between 28 and 37°C. Catalase and oxidase activity is present and nitrate is reduced to nitrite. The strain is able to hydrolyze gelatin and esculin, but urea is not decomposed. Preferred substrates for utilization, as tested with the BiOLOG system, are L-arabinose, D-ribose, D-xylose, glycerol, acetic acid, pyruvic acid, propionic acid, α-ketovaleric acid, and ß-hydroxybutyric acid . The strain is susceptible to amikacin, gentamicin, nitrofurantoin, polymyxin B, novobiocin and teichoplanin . C. woesei possesses a peptidoglycan type of A1γ, based on mesoA2pm. Meso-diaminopimelic acid is the diagnostic amino acid at position 3 of the peptidoglycan for all members of the order Solirubrobacterales, whereas members of the Rubrobacterales are characterized by L-Lys as the diamino acid at position 3 (peptidoglycan type A3α, L-Lys ← L-Ala). The tetrahydrogenated menaquinone MK-7(H4) was detected as the major component in C. woesei and Solirubrobacter pauli [1,25]. This is a remarkable feature, because MK-7(H4) if detectable in bacteria, has previously been reported as a minor component only. The main polar lipid was identified by two-dimensional TLC as phosphatidylinositol. Oleic acid (C18:1ω9c), 14-methyl-pentadecanoic acid (i-C16:0), hexadecanoic acid (C16:0) and ω6c-heptadecenoic acid (C17:1ω6c) constituted the major cellular fatty acids . Mycolic acids are absent. C. woesei ID131577T, DSM 14684, was grown in DSMZ medium 92  at 28°C. DNA was isolated from 0.5 to 1 g of cell paste using Qiagen Genomic 500 DNA Kit (Qiagen, Hilden, Germany) with cell lysis modification st/L  and over night incubation at 35°C. The genome was sequenced using a combination of Sanger and 454 sequencing platforms. All general aspects of library construction and sequencing can be found at http://www.jgi.doe.gov/. 454 Pyrosequencing reads were assembled using the Newbler assembler version 1.1.02.15 (Roche). Large Newbler contigs were broken into 6,955 overlapping fragments of 1,000 bp and entered into assembly as pseudo-reads. The sequences were assigned quality scores based on Newbler consensus q-scores with modifications to account for overlap redundancy and to adjust inflated q-scores. A hybrid 454/Sanger assembly was made using the parallel phrap assembler (High Performance Software, LLC). Possible mis-assemblies were corrected with Dupfinisher  or transposon bombing of bridging clones (Epicentre Biotechnologies, Madison, WI). Gaps between contigs were closed by editing in Consed, custom primer walk or PCR amplification. A total of 1,608 Sanger finishing reads were produced to close gaps, to resolve repetitive regions, and to raise the quality of the finished sequence. The error rate of the completed genome sequence is less than 1 in 100,000. Together all sequence types provided 29.15× coverage of the genome. The final assembly contains 79,136 Sanger and 580,261 pyrosequence reads. The genome consists of a 6,359,369 bp long chromosome. Of the 5,998 genes predicted, 5,950 were protein-coding genes, and 48 RNAs; 36 pseudogenes were also identified (Table 3 and Figure 3). The majority of the protein-coding genes (74.5%) were assigned with a putative function while those remaining were annotated as hypothetical proteins. The distribution of genes into COGs functional categories is presented in Table 4. We would like to gratefully acknowledge the help of Susanne Schneider for DNA extraction and quality analysis and Katja Steenblock for growing C. woesei cultures and Susanne Schneider for DNA extraction and quality analysis (both at DSMZ). This work was performed under the auspices of the US Department of Energy’s Office of Science, Biological and Environmental Research Program, and by the University of California, Lawrence Berkeley National Laboratory under contract No. DE-AC02-05CH11231, Lawrence Livermore National Laboratory under Contract No. DE-AC52-07NA27344, Los Alamos National Laboratory under contract No. DE-AC02-06NA25396, and Oak Ridge National Laboratory under contract DE-AC05-00OR22725, as well as German Research Foundation (DFG) INST 599/1-1.